Sought after by fine art galleries and top professionals, printing on "ChromaLuxe" Aluminum Panels by infusing dyes directly into the specially coated aluminum sheets (Dye Sublimation) is the ultimate in elegant presentation with startling clarity, sharpness, saturation and depth of colour, up to 96"x 48". FAQ 1: Is my image suitable to print on aluminum? FAQ 2: Which finish would suit my image best? High Gloss, Semi-Gloss and Silver Gloss Finishes. Sheet sizes up to 96"x 48"
Ready and easy to hang, lightweight. Hanging hardware is included in the price (if you don't need it and a discount will be applied). ​If it's a matter of taste then let's assume that you like the look of aluminum prints, so the next question is, will an aluminum print fit in with the surrounding decor? On this page you will see aluminum prints in many different settings. 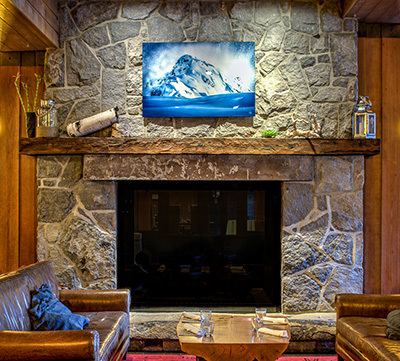 With modern architecture it is an obvious fit but aluminum can also look good in a 'traditional' setting as shown here and by the illustration of Stacey Bodnaruk's "Discovery Ice Cap 1" which hangs over the fireplace in Nita Lake Lodge in Whistler. 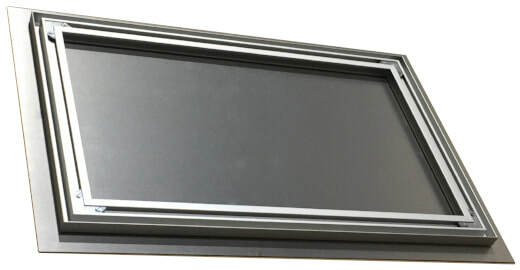 (See Care and Placing of Aluminum Prints below.) 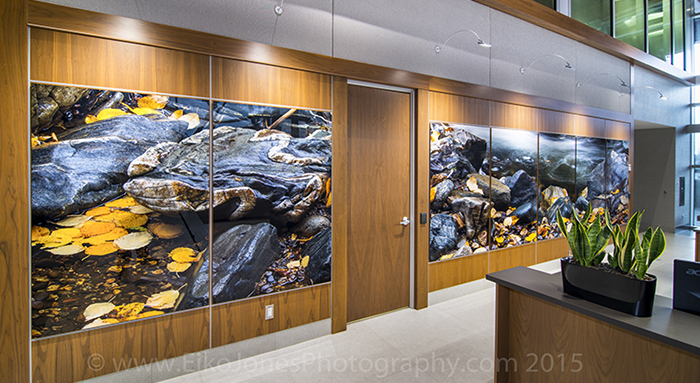 The simplicity of just an image floating in front of a wall, especially when combined with the deep gloss surface, lends an aluminum print great versatility when it comes to blending in with the surroundings. 2] "Which finish would suit my image best?" A: Which finish to choose, gloss or semi-gloss, also partly depends on preference but mostly on where is it going to hang, rather than on the image. Your preference regarding the finish, might need to be modified by where you intend to hang the print. Lighting and reflections off the surface could play a major role in your enjoyment of the print and should be carefully considered, as explained in detailed descriptions and illustrations of each finish below. If you are reselling your work you have no control over an unknown buyer's taste or environment, so deep gloss is recommended because it is the finish that really sets aluminum apart from other media and has the most impact on a viewer. Gallery lighting is always from above to avoid reflections on glass, so a deep gloss finish should look at it's best on a gallery wall. Vibrant, luminescent, brilliant, it is impossible to convey the full impact of the glossy finish in a photograph and equally difficult to describe in words: The deep gloss gives the colours unmatched depth and clarity, with reflections that do not so much block the image as they do on glass in front of an artwork, but rather they appear to exist behind the surface adding another element to the experience of the piece. Clients often say it's as if they have their own inner light source... One thing that is easy to convey is people's reactions when they see it for the first time - they just say "WOW"! Sometimes there are just too many windows or light sources where the aluminum print is to be hung, so that it's impossible to view from any position without reflections interfering with your appreciation of the image. Semi-gloss is the answer, it will at least subdue those problematic reflections whilst retaining some of the sparkle, depth and saturation that the gloss gives you. Rather than a white base, the aluminum itself shows through the highlights. This effect should be used with care as some subjects will look a little flatter, after-all when it isn’t directly reflecting light, it is grey, and it should be noted that a little of the sharpness is sacrificed. However the surface is perfectly smooth, it is not 'brushed' aluminum which further reduces sharpness, as in some competitors' products. The inks penetrate into the coated aluminum surface, ensuring that the image is permanent and can’t be rubbed off and the laminate is tough and completely impervious to water, whichever finish you select - to clean just wipe it off! 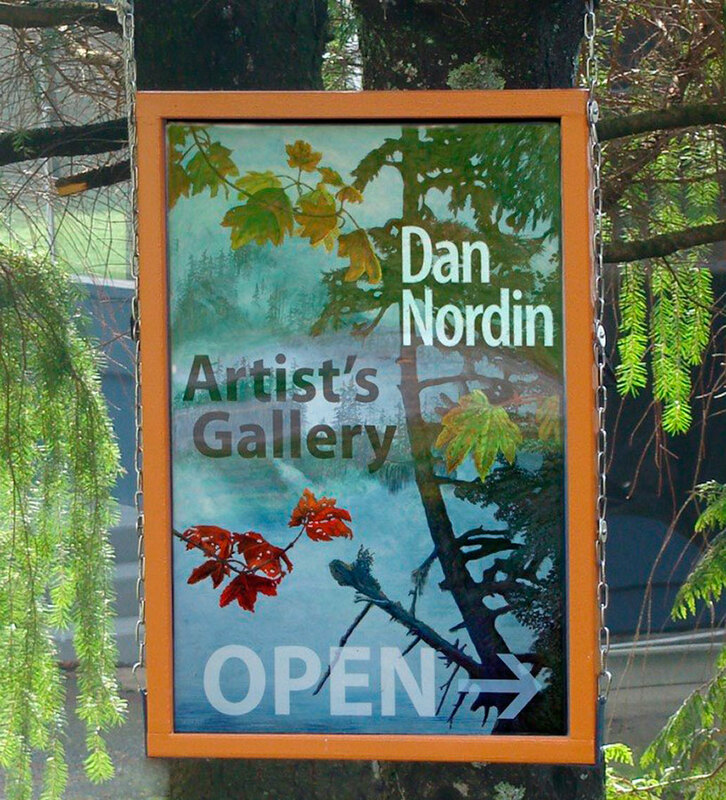 The aluminum itself won't be damaged, so if you have an outdoor art application we recommend printing on aluminum. Disclaimer: For long-term outdoor applications there is no guarantee of any period of longevity before fading becomes noticeable. This will depend on the location which will determine the amount and strength of the sunlight it receives. ​If you are providing art for an institution, public building or space, be sure to check into the building codes and regulations regarding wall art. We heard of a college that had to remove all of their canvases from the corridors because of the poor "flame spread rating" of canvas stretched on wood. Needless to say, they replaced them with prints on aluminum. Hanging Rails are attached to the back inset one inch from the outside edges. Supplied with 2 Euro-Hangers which can be either attached to the top rail and hooked over a "J" hook (not supplied), or attached to the sides to accommodate picture wire. Alternatively the rail can be hung over two screws/nails put straight into the wall. ​Cleaning: Soap and water are usually sufficient to remove fingerprints etc, but other products that can be used without harming the finish include isopropyl alcohol, household detergents and ammonia based glass cleaners. The surface is extremely scratch resistant but even so we would always recommend applying with a soft cloth, paper towel, etc. 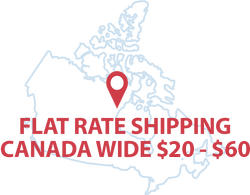 Moisture: Aluminum prints are moisture proof and therefore ideal for hanging in bathrooms, saunas, kitchens, etc., (and as mentioned above, outdoors) where other media might be damaged by the humidity. You can just wipe steam off the surface of an aluminum print and give it a polish up in the process using a soft cloth or similar. 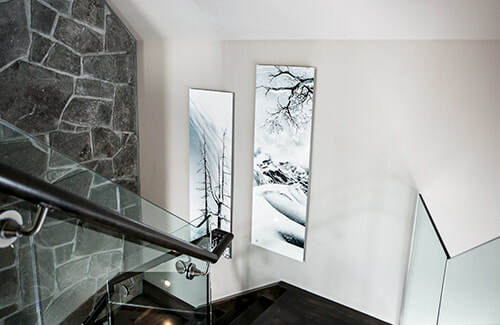 Temperature: Aluminum prints are more able to resist changes in temperature than traditional media and would be the best choice for a chimney-breast for example (right). Light: Aluminum prints have a longer archival life than other print media, but they will fade eventually just like any photographic print, so if possible avoid hanging in direct sunlight. Disclaimer: Aluminum Prints are printed on aluminum sheets that have been coated. The coating may contain some minor imperfections such as small bumps. Each sheet is inspected and if there are imperfections we place them in a part of the image which reduces their prominence. We cannot remake Aluminum Prints due to these imperfections unless they are located in a very prominent part of the image.